Although beautiful year-round, Carolina’s campus is particularly scenic when leaves change color each fall. 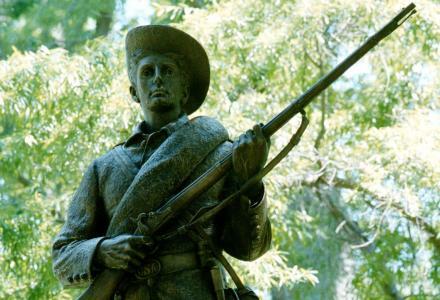 Erected in 1913 as a monument to the 321 alumni of the University who served in the Confederate Army during the Civil War, this statue is known by students as Silent Sam. Although the soldier holds a rifle, it is silent because he wears no cartridge box for ammunition. The university continued operation during the Civil War, thanks to President Swain’s reliance on wounded veterans and men who were exempt from military service.